The international project Platform of European Memory and Conscience awarded the prize to an illegally convicted in Russia, Ukrainian director Oleg Sentsov. 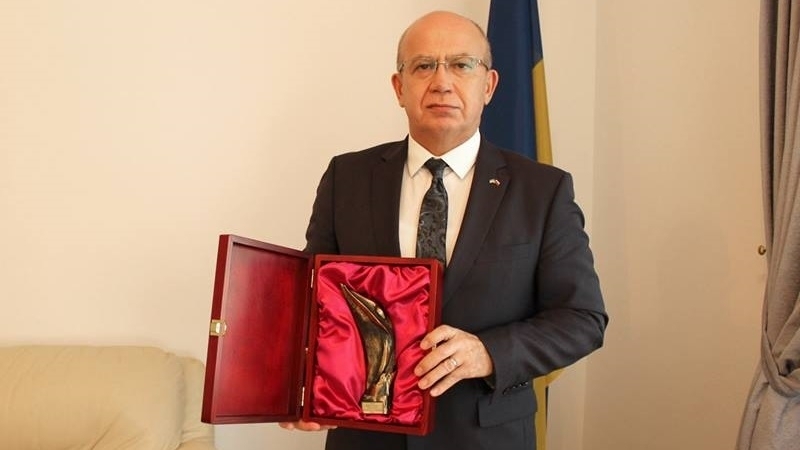 The award on behalf of the Ukrainian was received by the Ambassador of Ukraine to Slovenia, Mykhailo Brodovych, in the framework of the international conference "The Dark Side of the Moon". The Ukrainian Ambassador thanked the international community for solidarity with the Ukrainian political prisoners. The award will soon be given to the relatives of Oleg Sentsov in Ukraine. The platform of European Memory and Conscience is an international project aimed to investigate the activities and crimes of totalitarian regimes in Europe in the 20th century and prevent the resumption of totalitarianism. The project was created in 2011 during the summit of the Prime Ministers of the Visegrád Group in Prague. Oleg Sentsov became the winner of the Sakharov prize of the European Parliament for Freedom of Thought. He became the first Ukrainian ever to be awarded this high award. The Ukrainian political prisoner also won the Pro Dignitate Humana Prize from the Ministry of Foreign Affairs of Poland. Former Polish President Lech Walesa nominated Sentsov for the Nobel Peace Prize. Sentsov won the award of the International Economic and Humanitarian Forum Ukrainian ID Award.